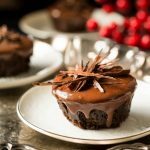 These Vegan Chocolate Cupcakes are absolutely out of this world! 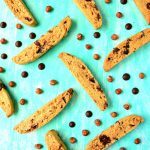 Moist, creamy and insanely decadent, plus they serve just two! It’s been a crazy weekend – partly because of the tropical storm Irma heading our way, and partly because I caught a nasty cold sometime Friday, and trying to fill a billion receptacles with water in anticipation of water outages while sniffling and sneezing until you feel like your head exploded isn’t how I would describe a fun weekend. But after the initial panic wore off, I figured I had enough water for a small drought saved up plus a few loaves of bread baked and ready; bread and water, one could live off that, I suppose, and if the worst should happen, my husband and I would survive the next couple of days unscathed, granted the giant tree outside the window doesn’t fall into my apartment- a disaster I dread every time a strong wind sends its branches slapping against the glass. I woke up to a cold, gloomy morning and turns out the storm’s severity has been downgraded yet again, and we might just escape it’s destructive path. Yet, if anything in this world is a certainty, it’s that Mother Nature can be a very fickle friend (do not blame her though), and you’ll never know if and when she decides to change directions or find another way to express her fury. Fury, that is stemmed from our neglect, and our general nonchalance at accepting the fundamental truth that our planet is dying, and we are at fault. It’s not enough that we watch the news and send prayers and happy thoughts, or even relief funds and materials to those affected by ‘natural’ disasters. There isn’t anything natural about the scale of destruction we are seeing (increasingly) today. Start small, and start soon. Make changes to reduce the waste you generate, and stop patronizing conglomerates and industries that are contributing to the detriment of our future. Live today, fight tomorrow doesn’t really apply to this scenario. If we do not fight today, we will not have a future to look forward to soon. Climate change is the primary reason I am trying to go VEGAN this year. But more on that and the evils of the meat and dairy industry later, as I’m still working on a comprehensive post explaining the whys, and no it’s not just because of animal cruelty. 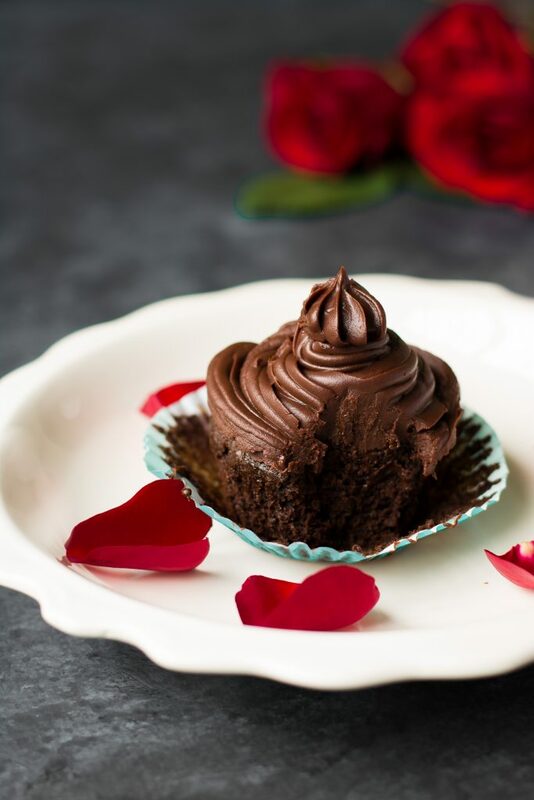 These VEGAN Chocolate Cupcakes are yet another proof that life without dairy and eggs isn’t as dreary as we once thought it would be. If butter is the price I pay today, for a few extra trips around the Sun alive, it’s a small payoff, don’t you think? The proof is in the pudding and when it comes to cupcakes, infallible proof is in the frosting. Coconut milk subs in for the more traditional butter and cream and she subs in good. Take one lick at the ganache frosting swirl on top, and I dare you not to make yummy noises. Do what you can for the environment today – unplug devices that aren’t being used, turn off the lights when you leave a room, recycle, or rather, upcycle whenever you can. If you can save something from reaching the landfill, even if it’s just one Styrofoam cup that you’ve re-purposed as a planter on your desk, believe me, you’re making a positive change. Most of the planters in my home are made of upcycled plastic, and it pleases me to watch life grow out of something that was destined for nothingness. Invest in life, and it will repay you, with life in return. Paint the world green, and we may just yet escape the horrors that await us. 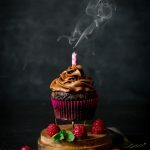 And when you decide to embark on a journey towards a better, more sustainable future, make yourself these Vegan Chocolate Cupcakes, because you, my friend, have earned it. And Mother Nature thanks you for your efforts. 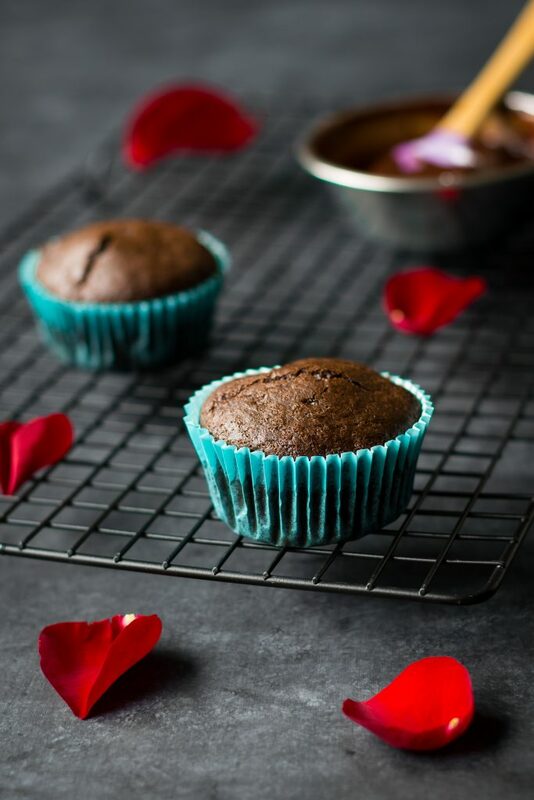 When you make these Vegan Chocolate cupcakes (which I really think you SHOULD! ), be sure to SHARE YOUR PHOTOS with me through Facebook, Instagram or Twitter. I’d love to see what you cook from here! Preheat oven to 350°F/180°C. Line a muffin tin with two cupcake liners. Combine the dry ingredients in a small bowl. Make a well in the center and add the oil, water and vanilla. Stir well to make a batter. Don't over mix. Divide the batter between the two cupcake liners. Bake in the preheated oven at 350°F/180°C for 18 minutes. While the cupcakes are baking, make the chocolate frosting. Heat the coconut milk until warm (do not boil) and pour over the chocolate chips. Make sure you use a small bowl, so the coconut milk will cover the chocolate. 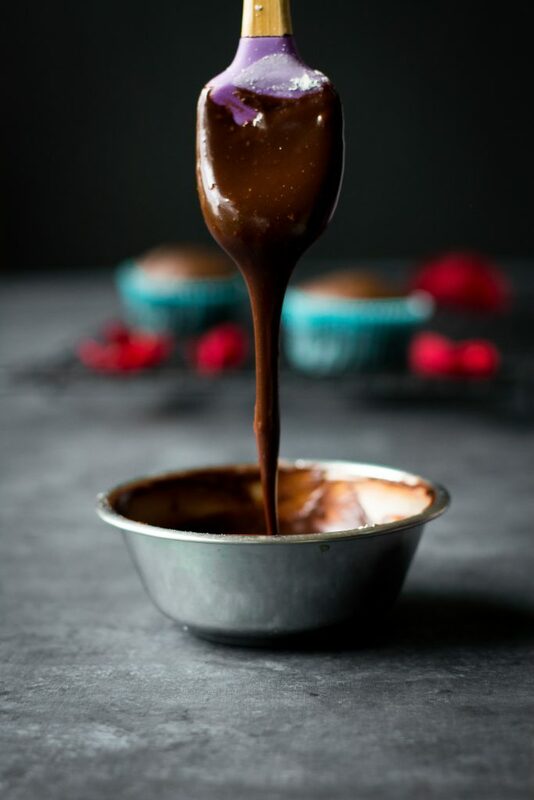 Let sit for a few minutes for the chocolate to melt, then stir till you get a smooth, creamy chocolate ganache. 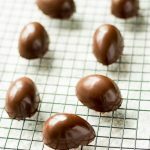 Stir in the icing sugar (make sure there are no lumps) and refrigerate for the frosting to thicken to piping consistency. 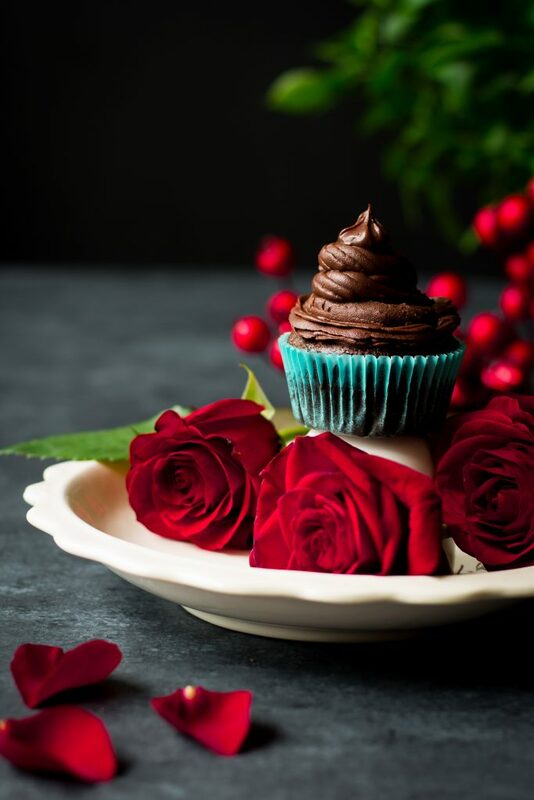 Transfer the chocolate ganache frosting to a piping bag fitted with your favorite icing tip. Once the cupcakes have cooled completely, pipe the frosting on top. Serve immediately. 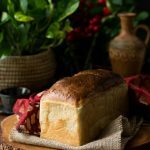 Can be refrigerated in an air-tight container for upto 3 days, but it's best served at room temperature and on the day of baking. 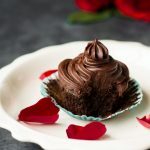 This cupcake looks so decadent and chocolaty! 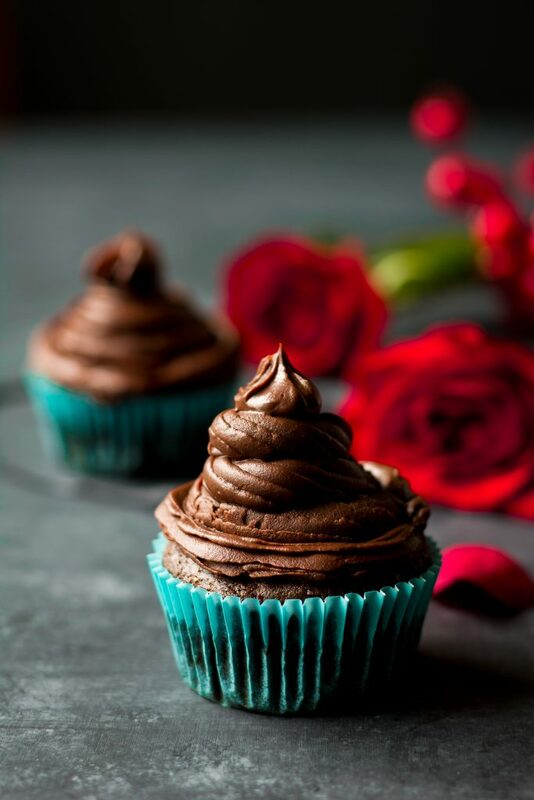 These chocolate cupcakes look AMAZING! And bonus points that these are vegan! This is a great comfort food to have while going through a storm. Keep safe and wish you the best in your vegan journey. Those are some lovely looking cupcakes! They look rich and moist and the frosting is beautiful. I’ll mark that down as another thing that coconut milk can do – it really is amazing stuff. 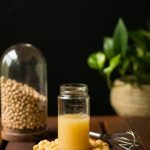 Coconut milk (esp the canned one) finds infinite uses in my vegan kitchen these days! OMG, the cupcake looks insanely delicious and gorgeous!!! I’m all for ‘Dessert for 2’ as that way we don’t have any leftovers that I’m under pressure to finish than waste….who wastes chocolate right 😉 Climate change has always been there and will be there in the future too and it is up to us to start treating ‘Mother Nature’ as our home ! Thanks Molly! Precisely why I like the ‘serves 2’ options!